Rukminee Holass Beepath Cd's & Songs For Sale, Vivaah Geet, Traditional Hindu Wedding Song, Maati Khor Night. Vivaaha Geet (Friday Night) Maati-Khor by Rukminee Holass Beepath is beautifully done with Musical accompaniment by Rana Mohip and Group, Drummer: Taradath Sawh, Guitarist: Bharat Singh, Chorus SIngers: Mona Madan, Ivy Ramdeen & Sumatee Ramesar. Cd comes in a Slim Line Hard Case. 15) Homa Bhailey - Havan being done. This Cd done by Rukminee is her original work, the Cd is an original, however it is not a factory made Cd. Each Cd comes sealed in a clear plastic.This Cd has some songs for Friday night (Maati Khor) for a Hindu Wedding Ceremony from Vivaaha Geet - the book - by Rukminee Holass Beepath. 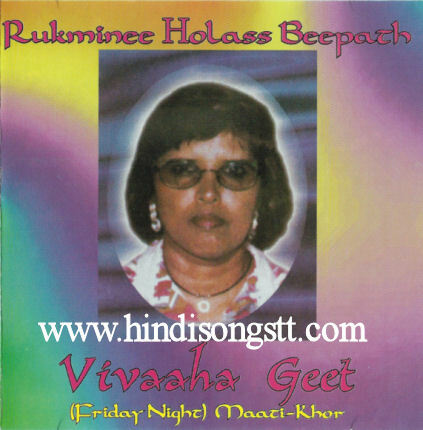 This Cd has been made available to Hindisongstt by Rukminee Holass Beepath. You can also visit this link http://www.hindisongstt.com/artist_detail.php?id=198 to read more about this great artiste Rukminee Holass Beepath and hear snippets of her voice.